A few months back, Netflix released an original series called Orange Is The New Black. Maybe you’ve heard of it. My partner Lauren sat down to watch it first, binged through the whole first season in something like two days, and then routinely reminded me that I had to watch it, but no really, I needed to watch it. I take her insistence in these situations very seriously (she did the same with Breaking Bad, and now I’m far more obsessed with that show than she ever was), so I fired up the Apple TV and began to summarily barrel through Orange as well. Maybe you’re a fan, and maybe not, but I found myself compelled to hit “Next Episode” every time the end credits appeared. The characters and overall narrative were fascinating, the hooks were solid, the dialogue was lean, crisp and, above-all, believable. Then I learned, low and behold, that Orange was based on a true story: the material was culled from Piper Kerman’s autobiography of the same name. Wow! All this highly dramatic stuff really happened inside a real-life women’s prison! Even the most researched and accurate nonfiction book is inaccurate by default, because once an event has elapsed into the past, it exists only in memory. Except not really. This BuzzFeed article by Leonora Epstein details six major differences between Kerman’s book and the TV show, namely that (mild SPOILER alert) the protagonist also named Piper was not, in fact, serving time in the same prison as her ex-lover, a drug-smuggler whose fed-ratting landed the little WASP in the hoosegow. Moreover, (MAJOR SPOILER ALERT), Piper did not rekindle her relationship with this woman, or ANY woman for that matter, while doing time. No, Kerman’s experience in the big house seems pretty tepid in comparison to the believably-impossible circumstances her screen counterpart undergoes. So why would Jenji Kohan, creator and show-runner of Orange, willfully employ such inaccuracies in her adaptation of a nonfiction book? Simple: Kohan took liberties with the truth in order to make a more interesting story. When I learned that some of the more compelling moments in the series were absent in Kerman’s book, I thought to myself, “Then what makes the book so damn good anyway?” Perhaps Orange as Kerman lived it is still a solid read (haven’t actually picked it up), but Kohan certainly proves that inaccuracies and downright fabrications do not necessarily deplete the quality of a narrative. All movies, after all, are pure fiction, even the true ones. The fine film version of Joseph Wambaugh’s The Onion Field begins with a title card which reads simply This is a True Story, but it’s not; the very medium fictionalizes, and there is no way to stop this from happening. We know that a police officer named Ian Campbell really was killed in that onion field...And we know there were no cameras there, grinding away, when those two small-time hoods blew Ian Campbell away...Movies produce fiction as a byproduct the same way that boiling water produces steam. This line of thinking, however, raises the question: are falsities inevitable (and perhaps even necessary) in literary nonfiction as well? I’m not talking about all-out literary fakes à la James Frey’s A Million Little Pieces (check Cath Murphy’s column from last year for a broader discussion of that type of fakery). I’m talking about the little lies, the subversion of a few facts cropping up in the larger truth. Think about the true crime genre’s granddaddy In Cold Blood, a beautifully-written book, both in its prose and its ability to captivate the reader with its gripping tale. Capote’s “nonfiction novel" also contains numerous factual inaccuracies, all of which are detailed (and cited) at Wikipedia. ...at a key moment in the 1959 investigation, when 19 days of utter bafflement ended with an informant stepping forward and naming the killers, the KBI didn't snap to action, according to the new documents. It didn't, as Mr. Capote's book says, dispatch an agent that very night to the Kansas farmhouse where one of the suspects had been living with his parents. Instead, the KBI waited five days to visit that farmhouse, according to the KBI documents. Dewey himself admits that parts of In Cold Blood are pure fantasy, citing the final scene in the book as Capote’s creation, not a recounting of actual events. In Cold Blood is, of course, only the tip of the false iceberg. Let’s go back to The Onion Field, mentioned above by Stephen King. Though my Google searches for cries of inaccuracy against this book yielded no results, I did learn that the author Joseph Wambaugh, a policeman-turned-novelist and literary celebrity long before The Onion Field’s publication, had later in life been accused of bribing a lead investigator for access to a high-profile murder case, leading to eventual claims of wrongful prosecution and unfair trial proceedings. Though no one else involved with the case has ever raised a stink, who’s to day Wambaugh was entirely on-the-level when he wrote The Onion Field? Karl Hettinger was newly assigned to felony cars and Ian was breaking him in. The partnership had jelled almost at once. 'You were in the marine corps too?' Ian asked, during the monotonous first night of plainclothes felony patrol. 'Really? So was I,' Ian said, flickering his headlights at a truck coming onto Santa Monica from the freeway. 'The voice with a smile,' Karl said, and they both grinned and made the first step toward a compatible partnership. Again, these are only two examples. Inaccuracies and fabrications spring up time and again in the nonfiction genre. That Stephen King quote from above emerges from his refusal to discuss the film adaptation of The Amityville Horror as anything other than fiction (because, again, in his view, all movies are fiction). He does acknowledge the slippery truthfulness surrounding the book, written by author Jay Anson and apparently based on an actual haunting. Snopes.com offers pretty significant evidence that the Lutz family experienced nothing out of the ordinary during their 28-day stay in the house, with more evidence supporting a hoax listed at Wikipedia. But we can’t deny that the Lutz family moved into this house, which was the scene of multiple grisly murders—for a bargain, sure, but still at considerable expense—and then, 28 days later, they abandoned the house. This much is true. We may never really know what happened during those 28 days (and most likely, the events detailed in Anson’s book don’t come close), but I’m inclined to believe something happened, and that something thoroughly terrified the family. I mean, even if the plan to hoodwink the country with a macabre, demonic tale was already in place, who abandons an expensive Long Island home in the middle of the night? Why lie? I believe the fabrications in The Amityville Horror were solidified and adhered to for one reason: to amplify dramatic effect and to make a more interesting narrative (remember Orange?). The list of inaccuracies and liberally selected/reworked/fabricated facts goes on and on, from John Berendt’s inserting himself into the events of Midnight in the Garden of Good and Evil, to Bill O’Reilly making up lurid details of female imprisonment in Killing Lincoln, to Hunter S. Thompson “fictionalizing” his trip to Sin City in Fear & Loathing In Las Vegas. In these and every instance, the reason is the same as above. We don’t want to read dull, uninteresting stories. Stories must have drama! Intrigue! Twists! Startling revelations! Etc.! So what do we make of this? Are we to spurn these works of (non)fiction because they tell lies alongside the truth? Do we commit ourselves to reading only the most factually accurate books? No. While we want our authors to strive for fact and tell as honest a story as they can, to discard any book that might contain mistakes or fabrications is silly. 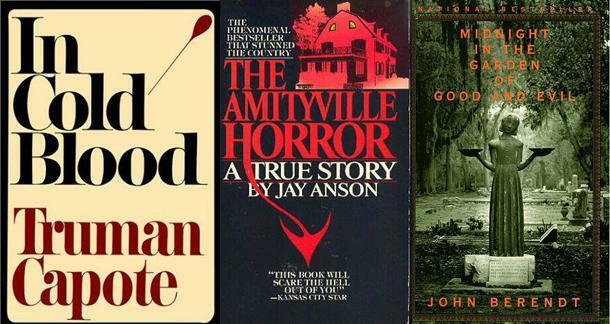 For one, doing so would be to deny ourselves the pleasure of reading In Cold Blood, which is a classic for a reason (it would also rob us of the cheesy pleasures Amityville has to offer). Two, as I’ve tried to establish, even the most researched and accurate nonfiction book is inaccurate by default, because once an event has elapsed into the past, it exists only in memory, or audio/video, if someone happened to record the incident. But even the cold gaze of the camera can deceive (it adds ten pounds, you know), and memory is about as reliable as a car with four flat tires. If you will only read accurate nonfiction books, you won’t read nonfiction at all. I think the best thing to do is accept that inaccuracies and fabrications of the kind I’ve discussed are a necessary evil toward good storytelling, and that any book, whether purported to be true or fictional, should be read for just that: good storytelling. Just be sure, if you’re interested in actual history, to read multiple books and articles on the topic at hand. You may never get to the real truth, but you'll be closer with numerous sources on your side. ...both “fiction” and “journalism” are artificial categories...both forms, at their best, are only two different means to the same end. Ponder on that, and weigh in with your thoughts below. If you care more about "storytelling" than accuracy, then you're not in it for the facts. If you're willing to do some work, facts do tell the story; that's one of the premises behind not only history, but science itself. Enjoyed your article. At times it seems fiction and fact are as intertwined as good and evil. Polar opposites that depend on each other for definition. @Tom1960 --- I must disagree. "Fiction" is "non-fact," but no one would seriously suggest that "fact" is most fundamentally "non-non-fact." (While it logically is "non-non-fact," that's a tautology and not necessary to point out. Even when pointing it out, "fiction" does not enter the definition.) "Fact" is "fact." "Fiction" depends on "fact," not the other way around. I have the feeling that fiction, in terms of storytelling, predates fact, but I could be wrong about this, like much else. i'm with JYH, if you want to fictionalize a true event for the sake of great storytelling (and this is a necessity when adapting a real life, or real life event) then just write fiction, change the names etc. You could still have the gem that is "In Cold Blood" without it being a willful deception of the actual facts. I don't know the context of the Hunter quote, but i'll go out on a limb and assume he's talking about getting at some greater truth beneath the story. I'd argue that this is something fiction is especially cut out to do. While journalism and documentaries are there to inform us of actual events that may impact our society and accuracy, though never fully achieved, is still important.